I have just come back from my last market for the next couple of months. Whew. Going to markets isn't really paying for itself but at least it gets me out and about. Tomorrow I have to get my headlight looked at after hitting a roo and cracking the glass. Another cost, it never stops, lol. The beds I put woodchip on are pretty free of all weeds except capeweed. I am pretty happy about that. The garlic and broad beans are growing nicely through the chips with no problem. 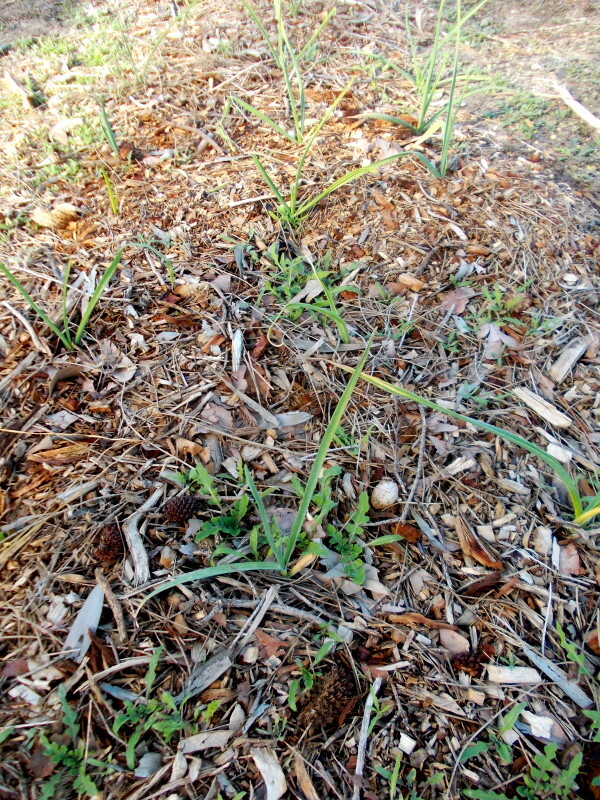 Capeweed is happy in nutrient lacking soil which is why it is happily coming up through the chip mulch. 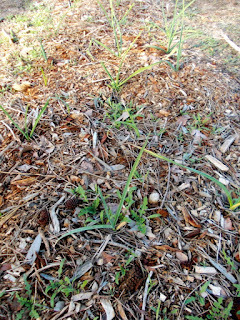 The bacteria that break down the woodchip takes the nitrogen out of the top few mm of soil which allows wees to germinate but then they die through lack of nitrogen, but capeweed can handle that so the seedlings are coming up as thickly as ever. Luckily they are a bit easier to pull up through the chips that on bare earth. So far the wood chips are working well, and I notice on Friday that the truck has come and left another load so I had better get out this week and put more out. Over the years I have met a few people who don't grow vegetables because they hate the look of vegetables and vegetable gardens. For those who think like this, here is a list of colourful looking and architectural vegetables that look at home dotted among the flowers. Most of these vegetables need just the same care as your flowers so it is no extra work to grow them in your garden. Silverbeet, or chard, comes in a few bright colours and is easy to grow. Just go out and pick a few leaves when you need, and let the plant grow more. They look amazing among flowers and compliment them nicely. They grow practically all year without looking messy, you just pull them out when they bolt and plant some more. 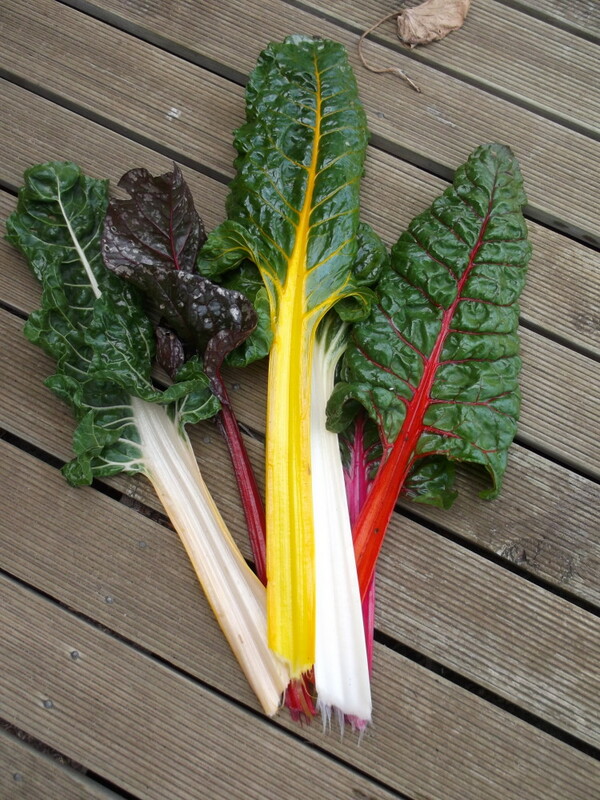 Another colourful veg that is fast growing. 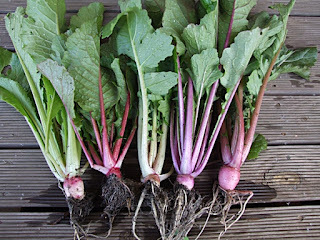 The flavour is a bit strong for me but would suit anyone who loves the flavour of mustard plants. They grow knee to thigh height so look good in a row behind smaller flowers. 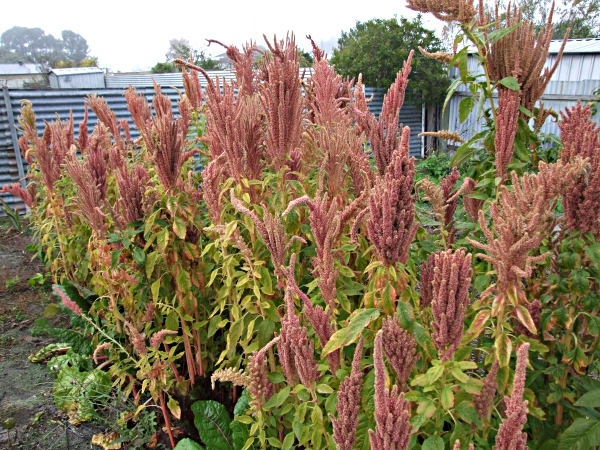 Amaranth is a summer grower that is both pretty and architectural. It grows tall so is good at the back of the garden and there are some with spectacular and bright flowers like 'Love lies bleeding' with its bright red, drooping flowers. 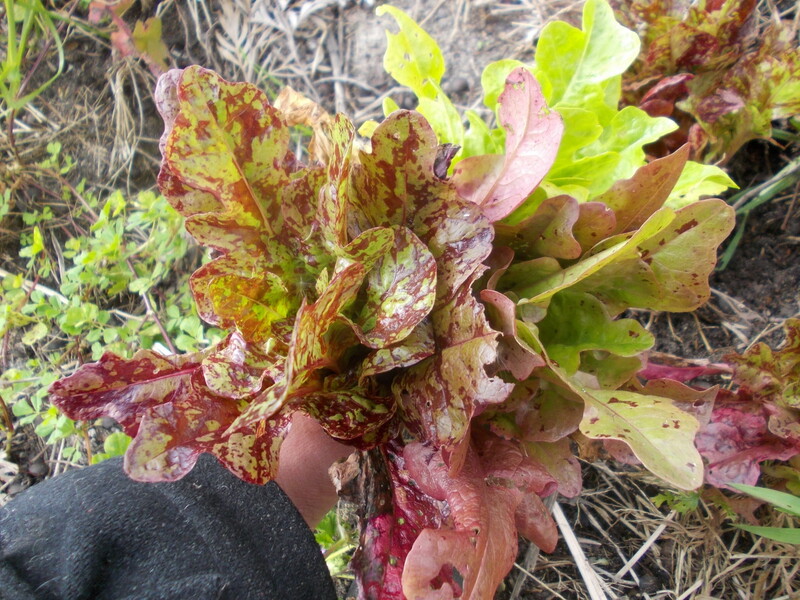 Amaranth is a superb leaf vegetable that is mild and non-bitter. The leaves are great steamed and served with butter. 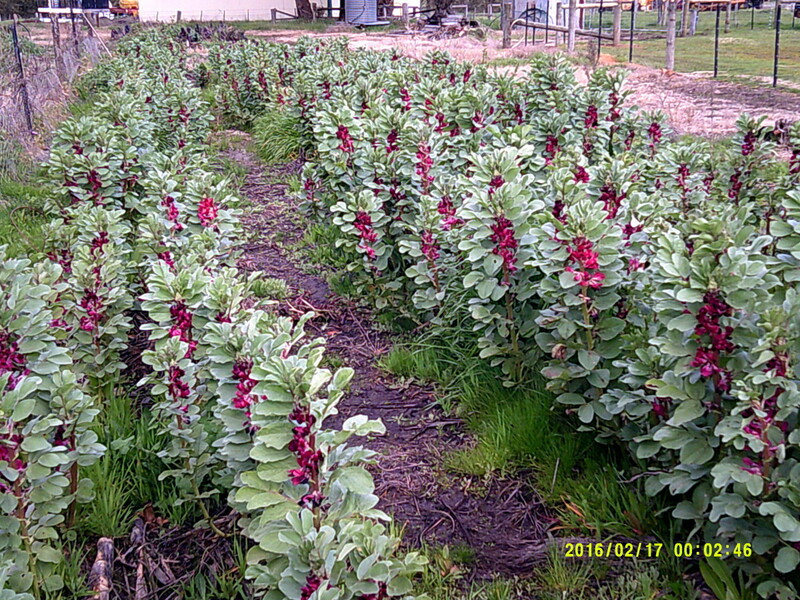 Red flowered broad beans make a colourful display all through winter, and have a bonus of young beans that are delicious raw or steamed. Triteleia 'Queen Fabiola' is a little bulb flower that produces blue flowers in spring, and delicious little bulbs that can be eaten raw or cooked. 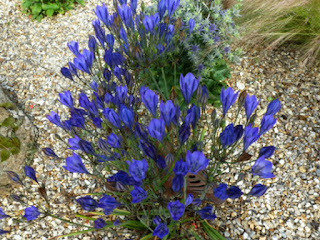 They only grow to about 20cm tall and packets of bulbs can often be found at Bunnings or bulb catalogues in late autumn. 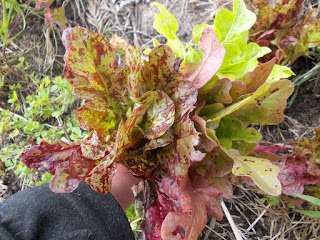 There are heaps of beautifully coloured lettuces available that can be scattered among your flowers. They can come in shades of red and green with red speckles and patches. This is not a great pic of a flower but Rosella produces heaps of pretty flowers that come out cream and turn pink over the day as they age. The fleshy sepals are used in teas and jams, and the baby leaves are great in salads and taste like sherbet. 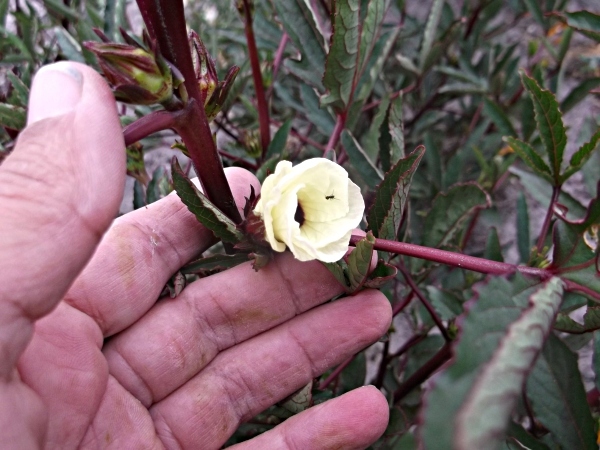 The red stems of the plant is pretty in itself. You can't go past globe artichokes for making a statement in the garden, and if you don't eat the flower buds, you can leave them to go into flowers which are large and purple. 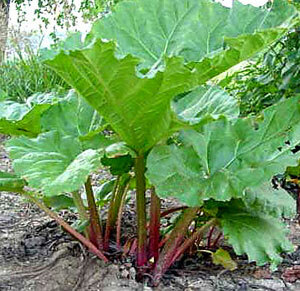 You might not think of rhubarb but it is quite stunning behind your flowers with its large leaves. It makes a statement and shades out weeds at the same time. I grow diploid potatoes which are not quite the same as the ones you find in your supermarket. The diploids produce masses of flowers in shades of purple, pink and white for a long period. 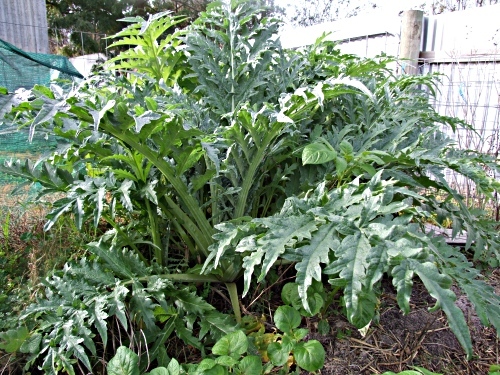 It is a bargain of a plant as you can propagate the plants easily with the tubers left over from choosing the ones to eat. The tubers also come in a range of skin and flesh colours. Pity I forgot to get any pictures of a plant flowering.